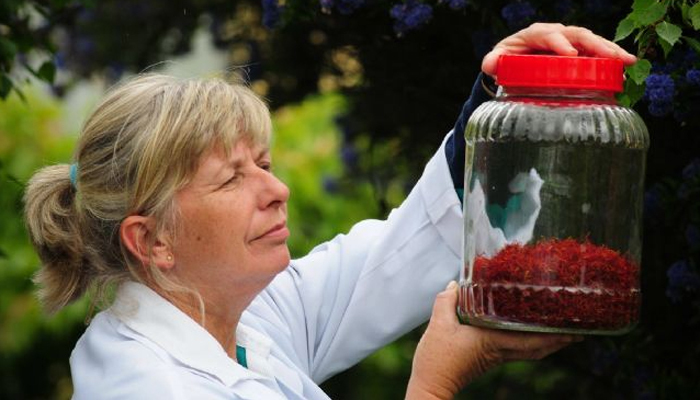 Nicky Noonan looking at about $7,500 worth of her Tas-Saff saffron. Had another great dinner at Henry’s in the Henry Jones Art Hotel. A lovely, fragrant seafood soup made with lots of local fish and mussels and flavored with saffron. After dinner, Andre Kropp, the executive chef, came out and we talked about the meal over a glass of wine. I told him that, for me, what really made the dish, besides the fresh assortment of seafood, was the saffron. It seemed particularly delicate and flavorful. I asked him if it was from Spain. Nope, he said. It’s local. I thought he was joking. Or that he meant it was “local” in the sense that he had picked it up from a local restaurant supplier. But he told me there was a crazy couple who had a saffron business up in the Huon Valley. I called up my buddy Sally Legosz of Herbaceous Tours and asked her if she knew anything about them. Of course, she knew them. Said she was planning on taking a cake out to the owner, Nicky Noonan, the next afternoon since it was her birthday and asked me if I wanted to join her. When we arrived at Glaziers Bay, which is where the Noonan’s Tas-Saff farm is located, Nicky, who looks a bit like Penny Marshall’s younger sister, was somewhat frantically running about the place. She’d just gotten a call saying some Australian food inspector was coming by for an impromptu visit. The Tassies are crazy about quarantine laws and the like and since a big part of what happens at the Tas-Saff farm is the sorting and packaging of crocus bulbs, which are then parceled out to some 50 bulb growers throughout Tasmania, these inspectors, she explained, are very concerned about how clean your facilities are and making sure there’s no contaminated soil on the bulbs. Anyway, Nicky took us inside the tiny little room where the spice is measured on carefully calibrated scales that are so sensitive that they can be affected by people just walking across the room, where she made tea while Sally cut into the cake she’d brought with her. I asked Nicky what made her decide to get into the saffron business. Twenty years ago, the Noonans imported 5,000 corms from Europe. It took three years before they got their first flowers. Which they harvested by hand. A decade later, they were harvesting nearly 120,000 flowers from their little plot and getting about a pound of saffron for the effort. “Crazy, right?” says Nicky. Which is why they developed a growers network throughout Tasmania to grow the flowers for them. Still, all the saffron ends up here at the Noonan farm where two seasonal workers carefully weight and package it before shipping it off to food geeks who clamor for it—like Chef Andre Kroop. I can’t believe I had no idea where saffron came from; now I won’t complain when I pay for it. Now let me guess…when you come back you’re going to make whiskey and grow crocus flowers (I think there’s a song in there somewhere). Are you going to Tas-man-ia. Cro-cus flowers, Tas whis-key, and emu. Remember me to the one who lives there, she once once a true love of mine. I’ll tell her to find you an acre of land. And thanks….now I have that song in my head.